Targeted therapeutic nanoparticles that accumulate in tumors while bypassing healthy cells have shown promising results in an ongoing clinical trial, according to a new paper. The nanoparticles feature a homing molecule that allows them to specifically attack cancer cells, and are the first such targeted particles to enter human clinical studies. Originally developed by researchers at MIT and Brigham and Women’s Hospital in Boston, the particles are designed to carry the chemotherapy drug docetaxel, used to treat lung, prostate and breast cancers, among others. In the study, the researchers demonstrate the particles’ ability to target a receptor found on cancer cells and accumulate at tumor sites. The particles were also shown to be safe and effective: Many of the patients’ tumors shrank as a result of the treatment, even when they received lower doses than those usually administered. The Phase I clinical trial was performed by researchers at BIND Biosciences, a company cofounded by Langer and Omid Farokhzad in 2007. “This study demonstrates for the first time that it is possible to generate medicines with both targeted and programmable properties that can concentrate the therapeutic effect directly at the site of disease, potentially revolutionizing how complex diseases such as cancer are treated,” says Farokhzad, director of the Laboratory of Nanomedicine and Biomaterials at Brigham and Women’s Hospital, associate professor of anesthesia at Harvard Medical School and a senior author of the paper. Researchers at Dana-Farber Cancer Institute, Weill Cornell Medical College, TGen Clinical Research Services in Phoenix and the Karmanos Cancer Institute in Detroit were also involved in the study. Langer’s lab started working on polymeric nanoparticles in the early 1990s, developing particles made of biodegradable materials. In the early 2000s, Langer and Farokhzad began collaborating to develop methods to actively target the particles to molecules found on cancer cells. By 2006, they had demonstrated that targeted nanoparticles can shrink tumors in mice, paving the road for the eventual development and evaluation of a targeted nanoparticle called BIND-014, which entered clinical trials in January 2011. 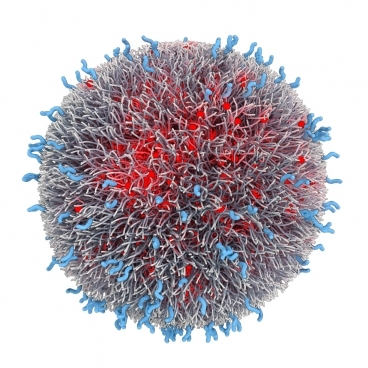 For this study, the researchers coated the nanoparticles with targeting molecules that recognize a protein called PSMA (prostate-specific membrane antigen), found abundantly on the surface of most prostate tumor cells as well as many other types of tumors. One of the challenges in developing effective drug-delivery nanoparticles, Langer says, is designing them so they can perform two critical functions: evading the body’s normal immune response and reaching their intended targets. “You need exactly the right combination of these properties, because if they don’t have the right concentration of targeting molecules, they won’t get to the cells you want, and if they don’t have the right stealth properties, they’ll get taken up by macrophages,” says Langer, also a member of the David H. Koch Institute for Integrative Cancer Research at MIT. The BIND-014 nanoparticles have three components: one that carries the drug, one that targets PSMA, and one that helps evade macrophages and other immune-system cells. A few years ago, Langer and Farokhzad developed a way to manipulate these properties very precisely, creating large collections of diverse particles that could then be tested for the ideal composition. All of the particles are made of polymers already approved for medical use by the U.S. Food and Drug Administration. 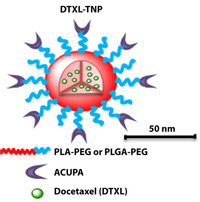 The researchers also found that in animals treated with the nanoparticles, the concentration of docetaxel in the tumors was up to tenfold higher than in animals treated with conventional docetaxel injection for the first 24 hours, and that nanoparticle treatment resulted in enhanced tumor reduction. The Phase I clinical trial is still ongoing and continued dose escalation is underway; BIND Biosciences is now planning Phase II trials, which will further investigate the treatment’s effectiveness in a larger number of patients.